Public Health Law Research: Theory and Methods definitively explores the mechanisms, theories and models central to public health law research – a growing field dedicated to measuring and studying law as a central means for advancing public health. 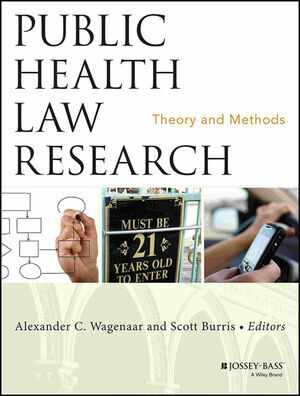 Editors Alexander C. Wagenaar and Scott Burris outline integrated theory drawn from numerous disciplines in the social and behavioral sciences; specific mechanisms of legal effect and guidelines for collecting and coding empirical datasets of statutory and case law; optimal research designs for randomized trials and natural experiments for public health law evaluation; and methods for qualitative and cost-benefit studies of law.. They also discuss the challenge of effectively translating the results of scientific evaluations into public health laws and highlight the impact of this growing field. Alexander C. Wagenaar, PhD, is a professor of health outcomes and policy at the University of Florida College of Medicine, and associate director of the Public Health Law Research program, a national program of the Robert Wood Johnson Foundation. Scott Burris, JD, is a professor of law at Temple University, where he directs the Center for Health Law, Policy and Practice and the Public Health Law Research program, a national program of the Robert Wood Johnson Foundation.